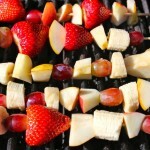 Family Friendly Fridays ~ Grilled Organic Fruit Kabob Recipe!Family Friendly Fridays ~ Grilled Organic Fruit Kabob Recipe! Learn how to make these delicious family friendly organic fruit kabob recipe that everyone will love! You need 6-8 metal or wooden skewers. If using wooden skewers, soak them in water to help prevent them from burning on the grill. Cut fruit into similar size chunks and put on skewers. Preheat grill over medium to medium low heat. In a small saucepan, melt honey on low heat (just until melted) with the butter. Place the skewers onto the grill and baste the skewers with honey glaze. Cook for 5 minutes and turn and cook for 3-5 more minutes. Continue to baste the fruit throughout the cooking time.